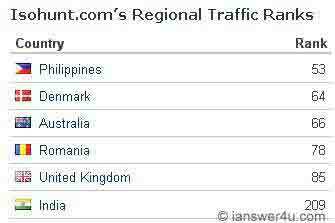 Which country downloads most from torrents? Torrents are probably the most common and widespread application using P-2-P network architecture. Though started as a way to share some small files among peers without much hassle of setting up a server, it became a boon for transfer of copyrighted media files across internet. A torrent file is a small sized (usually less than 100 KB) metafile which contains information about all files which can be downloaded as well as address of tracker that enables communication among peers. This torrent file when downloaded and opened using bitTorrent software (e.g. uTorrent), enables downloading of files from various seeds and peers present in network (swarm). This simple and easy working is used extensively now-a-days, by large masses of net users to download 'illegal' movies, softwares, songs, games, etc. This free transfer of copyrighted content has increased the threat of piracy and has become a headache for content providers. Where torrents are downloaded most? One of these days I was checking Alexa ranking of my site (which is pretty low) and just out of curiosity happened to check Alexa ranking of Torrentz, one of the most used search engines for torrents. From that point I started my own secondary research to find which country is downloading files most using torrents. I have used only Alexa and few popular torrent sites for coming up with results. Torrentz for torrent users is what Google is for others. Most people visit this meta search engine for their torrents rather than going to torrent sites directly. Torrentz too had its tryst with strict US authorities which forced it to go from .com to .eu domain. Torrentz is the 125th most visited site globally. Now lets take a look at regional traffic stats of Torrentz on Alexa. From the image it is clear that India, with its large internet using population, uses Torrentz most in its quest for torrents. 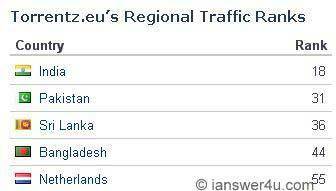 Incidentally other countries in Top 4 countries visiting Torrentz, are all neighbors of India. From this info it looks India might be on top list of torrent downloads. But I wasn't convinced yet and thus i started researching on traffic of various top torrent sites (my list may not be really good because i don't know many torrent sites). And after a bit of research zeroed down to one of the most popular torrent sites at present. Next up was Isohunt with its global rank of 220. Unlike Torrentz it has a database of torrents with itself and this database is huge by any measure. According to isoHunt, the total amount of shared content was more than 13.44 petabytes as of September 29, 2011. So I felt this site will be perfect for my research. And results were ........ a bit different. a) India has 2nd largest population in the world. b) Though internet usage percentage is still low but number of people using web in India, is definitely more than those using it in Philippines, Denmark, Australia, Romania or for that matter United Kingdom. Against this break drop, India's 209 ranking doesn't sound as bad as it did initially. So I have evaluated a torrents search engine, a full-fledged torrent site and next just to be sure about my findings (and to give them a bit more creditably) i decided to evaluate traffic to two of the most common BitTorrent softwares / clients, for any platform Windows or Mac, viz. UTorrent and BitTorrent. These softwares help to open .torrent file and enable download of files over peer to peer network. Although country-wise downloads of these softwares wasn't available but at least visits to these sites can give an indication of people from which country are downloading (or at least intending to download) these free softwares. After all this, I do feel India downloads most from torrents. 1) Its large internet savvy young population. 2) Increasing internet penetration and increasing bandwidth. 3) Its large local movie industry. 4) Unlike US, Indian piracy laws are still not stringent. 5) My use of Alexa to measure traffic. Alexa is not an accurate measure for visits and page views of a site. As it counts only page views from visitors having Alexa toolbar installed on their browsers. Usually webmasters keep them installed and as numbers of Indian webmasters in web space is quite large, it can be safely assumed they have Alexa toolbar and their visits to torrent sites are getting counted the most, unlike people from other countries. How to prove you are not a liar to your special someone ?